Unfortunately this doesn’t work for function modules and function groups, there you need to use function module RS_FUNCTION_RENAME and update the references manually. Sorry but it’s not refactoring, it’s renaming. Certainly renaming can be part of the refactoring process but hardly qualifies as refactoring by itself IMHO. Was expecting much more from this blog, based on the title. You might want to change it or at least correct the typo. I do agree that I had higher expectations from the blog title. But I also accept the point that the renaming-tool in AiD is one of its refactoring tools. I think changing the title to make it clearer that blog is about only that aspect is a good idea. I will call refactoring the discipline to change the internal code structure without changing its observable behavior. For me the hard part is the discipline. Change is risky and we perform safe changes in small steps to reduce the risk. Although Refactoring is not only renaming, automatic renaming surely qualifies as one of the small steps in my view. It is nice when tools allow us to refactor safely, without only having to trust our coding ability or our test suite. 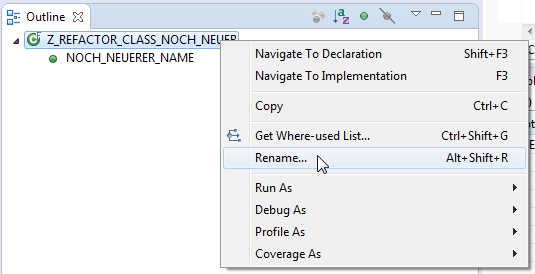 In the ABAP Workbench we can move methods of global classes, I am quite sure AiE implements more steps that are not described here (Ctrl+1). Isn’t it possible to extract methods safely? refactoring, it means, that you want to do restructuring an existing code to improve the code. IF you have a code which is really hard to be readable, then you need to refactor the code ( divide code to parts) to be easily and understandable. Off course you’re right – it’s “only” renaming. But it’s much more powerful since it updates all dependent objects. Right now, we’re facing the problem that we can’t move to a namespace we own – any ideas? 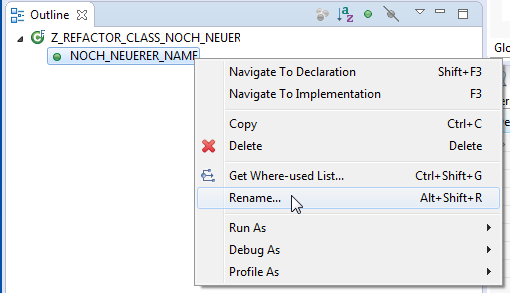 Eclipse says that moving from a Z devclass to a namespace devclass is not possible. There’s a lot of text, examples, limitations and so on, but I don’t see a section explainin what there actually is to do (e.g. “right-click on literal -> Choose ‘refactor’ … ). 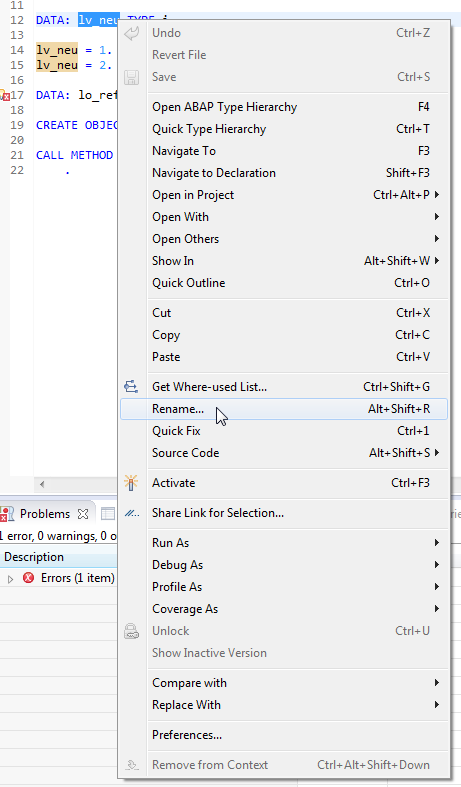 All supported transformations are available through the quick fix menu that can be triggered from the Source menu or through the Ctrl+1 shortcut. As an alternative the Quick Assist view provides a permanent view on the available quick assists. ok, undestood, thanks for the clarification! BTW, I found a way to move to a namespace. You just have to move the objects in $TMP, if this is not possible as the objects have been exported already you can manipulate TADIR using SE16(n). Maybe you can try to replace the whole coding block?